The 4K element brings an enhanced style to complement your Tactical series games. Using a minimal hex grid, augmented with new custom terrain and buildings, these maps immerse you in the action with a fresh new look and feel. 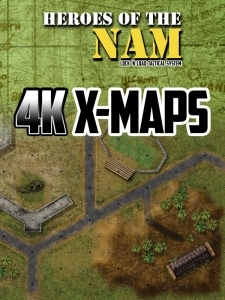 Extra maps have also been added with corrected terrain features, replacing those that require certain terrain for some scenarios. No longer do you have to imagine that Bocage are hedges, or buildings and rice paddies are clearterrain, we’ve taken care of that for you. Requirements: Heroes of the Nam is required to use this product.